BEGO OSS is a bovine bone substitute material with which the natural properties of the bone tissue are retained. Targeted modifications of the initial bone result in a bone substitute material which achieves rapid integration in patients' own newly formed vital bone. All organic components are removed by means of sintering to leave only the mineral phase of the bone. BEGO OSS meets the most stringent safety standards for xenogeneic bone substitute material. 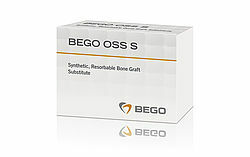 BEGO OSS S is a synthetic resorbable bone substitute material. Thanks to the intelligent combination of two homogeneously distributed phases, rapidly resorbing ß-tricalcium phosphate (40%) and volume stable hydroxyapatite (60%), premature resorption is counteracted. The original collagen structure of porcine pericardium is retained in the BEGO Collagen Membrane. The natural cross-connections of the collagen fibres guarantee excellent compatibility and a long-lasting barrier function. The collagen fibres create a 3D network which gives the BEGO Collagen Membrane its multi-directional stability and suppleness. The BEGO Collagen Membrane is cell-occlusive, has a smooth side for adaptation of the soft tissue and a rough side as a guiding structure for blood vessels and bone cells.